A gorgeous, velvety soup that’s full of flavor. 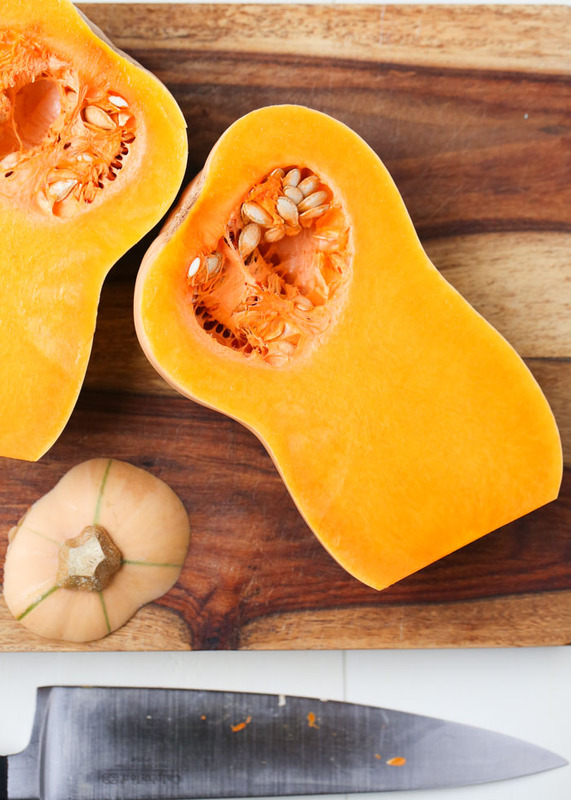 It’s oh-so easy to make, too – no peeling or dicing, just roast your butternut halves, peel off the skin, an blend the squash with ginger, vegetable broth, coconut milk, and a tiny splash of maple syrup. Yummmm. If you’re looking for a simple and straightforward dinner recipe after the hubbub of the Thanksgiving holiday and before Christmas madness really sets in, I’ve got you covered! 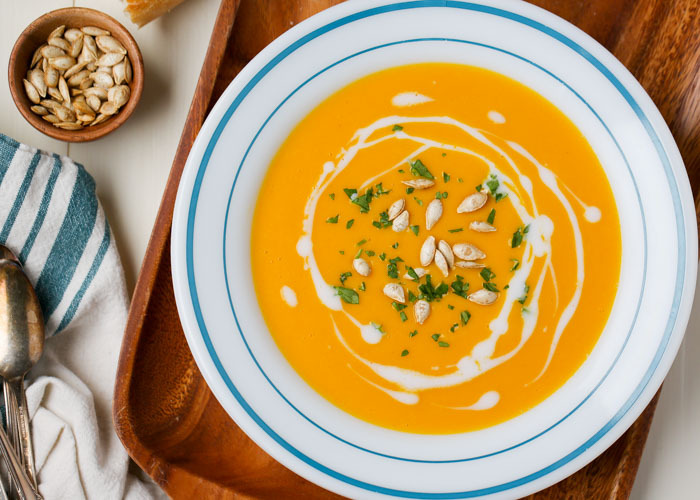 I created this Simple Butternut Squash Soup recipe after I’d taken a course of antibiotics and my tummy was none too happy with me. So I was looking for something comforting and soothing, with the micronutrients I craved but something that didn’t make me have to reach for the TUMS immediately after. 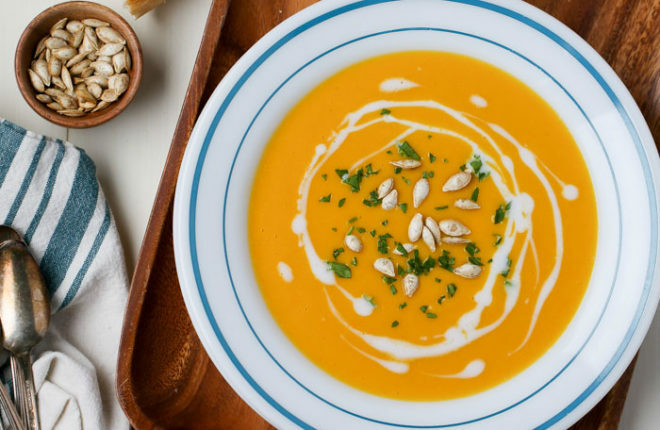 Squash, as it turns out, is great for upset stomachs – and ginger, of course, is a no-brainer as far as that goes too. 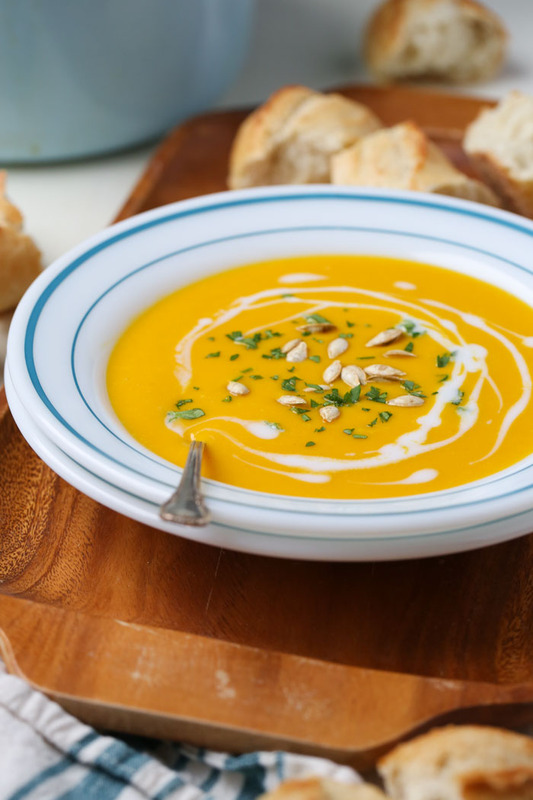 This simple butternut squash soup recipe is vegan, but it’s another one of those happily vegan recipes that tastes so delicious that I’d venture to say even the carnivores will love it. My carnivorous guy definitely approves! 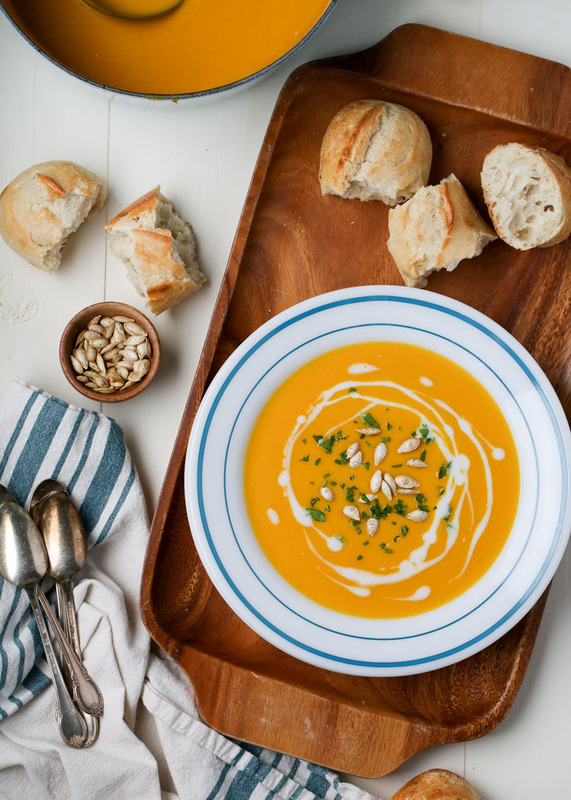 Ginger and coconut milk pair magically with creamy butternut squash, and the tiny kiss of sweetness from the maple syrup gives this butternut squash soup recipe a special little boost. 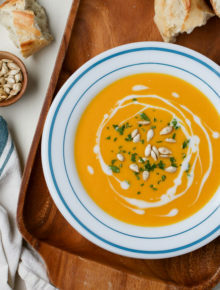 So what makes this butternut squash soup recipe so simple? Well, first, you hardly have to touch your butternut squash. No peeling, no dicing. Can I get a huzzah?! Simply cut that bad boy in half, scoop out the seeds, and roast each half in the oven. SO EASY. And the list of ingredients? Pretty short! Just nine ingredients, and that’s if I include the olive oil, salt, and pepper. 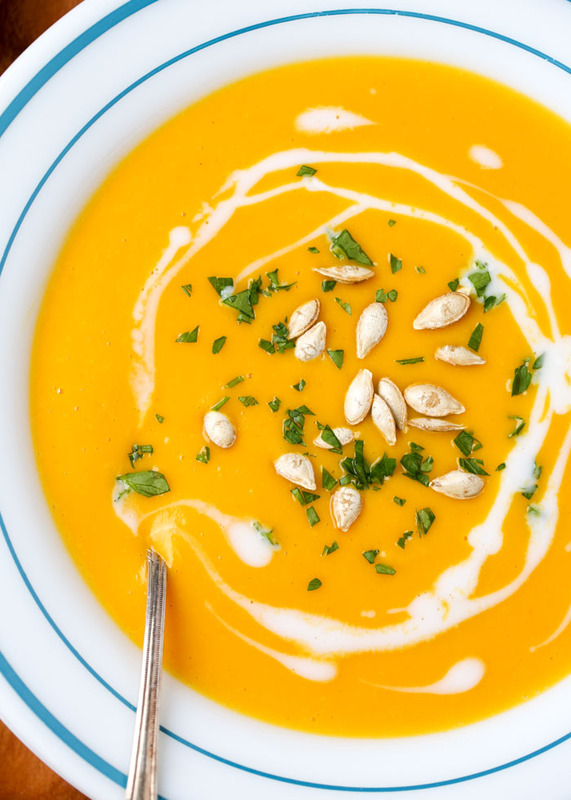 I hope you love this Simple Butternut Squash Soup recipe as much as we do. It’s definitely earned immediate keeper status around here – no upset tummies required! Preheat oven to 400 degrees Fahrenheit. Using a sharp, sturdy knife, carefully cut off the stem of the butternut squash, then cut the squash in half vertically. Scoop out the seeds and either discard or save for roasting. Brush the inside of each half with the 2 teaspoons olive oil and place cut side down on a rimmed baking sheet. Bake until a fork easily pierces the flesh, about 45 minutes. Remove squash halves from oven and set aside to cool a bit. Set a medium pot over low heat. When hot, add the olive oil and then the onion. Sweat the onion, stirring occasionally, until tender and translucent but not golden, about 8 minutes. (To sweat onion, make sure your heat is low and you can barely hear a sizzle). Add 1 1/2 cups of the broth, ginger, 1/2 teaspoon salt, 1/4 teaspoon pepper, and maple syrup. Bring to a simmer. Simmer, covered, for 5 minutes. Peel the skins off of the cooked butternut squash and add cooked flesh to the pot. Using an immersion blender or working with a countertop blender in batches, puree the entire mixture. 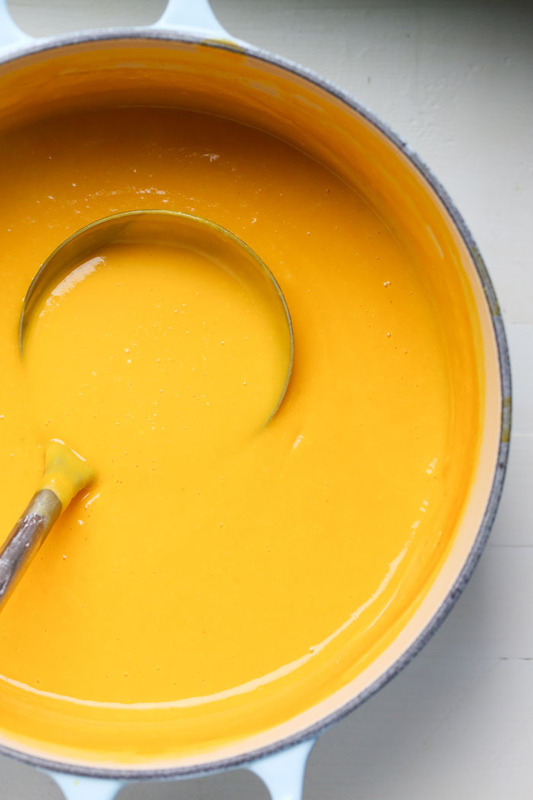 Return the puree to the pan (if you are using a countertop blender; if you used an immersion blender, you’re already there!) Stir in the coconut milk. Bring back to a simmer. Taste and add additional salt and pepper if desired. If you prefer your soup to be thinner, add the remaining broth. Remove from heat, ladle into bowls, and add garnishes if desired. Serve. Store leftovers in an airtight container in the refrigerator. Keeps for about 3 days. * Black pepper will also work. I use white pepper because I think the soup looks prettier without the little black specks. Loved it! Wish there was an easy way to peel the squash tho’. Has anyone made it using squash that had been baked beforehand? Even our picky-eating boys ate this one! Very healthy, too. Thanks for your sharing and wait a new post. The skin peels right off, super easily, after you roast it! That’s the beauty of this recipe. If you find it doesn’t peel easily, you can cook it for a little longer or use a spoon to scoop it out of the flesh.